Want to recover your deleted, lost or corrupt PHOTOS, AUDIO or VIDEO files? 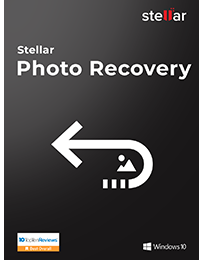 Try Stellar Photo Recovery software that will effectively restore your digital media files not only from SD cards but also from external storage, digital cameras, USB sticks and even from hard drives. Recovers photos from all digital camera brands such as Canon, Nikon, Sony, Kodak, Fuji, GoPro etc. It facilitates recovery of photos from memory cards, digital cameras, hard drives and flash drives. As it supports FAT32, NTFS and ExFAT file systems, so restoration of photos can easily be initiated for any kind of logical drives, attached storage media, physical disks, as well as saved image file. Its capability is not limited to recover photos only. It can even retrieve different audio and video file formats stored on all type of storage devices. It effectively recovers audio files such as RPS, OGG, WMA, MP3 as well as video files such as AVI, F4V, WMV, MP4, ASF, MOV and so on. With continuous usage, external and internal drives tend to develop bad sectors that often damage the data stored on them. With Stellar Photo Recovery, you can create sector-by-sector image of the storage media, so that data stored on the remaining good sectors can be saved. This software lets you preview the deleted & inaccessible media files in 3 preview types before you recover them. Classic List displays the items as they are found on the hard disk, File List lists the items as per media type and Deleted List lets you see the list of deleted items. If you are not able to see the file format of the item you wish to recover from the list of supported file types, then you can either edit the existing file type or can add new file header to it manually or automatically. This feature makes it the best among the others. It supports RAW recovery of the files in case the usual recovery procedure does not yield satisfactory or desired results. RAW recovery works on the principle of file signature recognition and thus conducts a deeper scan to retrieve the lost or deleted files more accurately. Step 1 – Search for media files by selecting the drives or folder you want to search and click on ‘Scan’ to initiate scaning process. Step 2 – After scanning is finished, select the files from the list that you want to recover by checking them. Step 3 – Select the location where you want to save the recovered files and click ‘OK’ to preview & save the recovered files. Our software is free of any forms of malware or virus. It is completely safe to install and run. Your satisfaction is our top priority. We provide you really fast service 24×5. We promise up to 30-day money back guarantee.